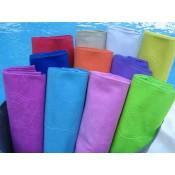 Quick Drying, Lightweight, Absorbent Microfiber - Perfect for team or individual embroidery! Beautiful embroidery is available! Just choose your embroidery option from the pull down and then type what you would like embroidered above . You can also choose your thread color from the other pull down! Perfect for swimmers, boaters, picnicers, or any outdoor activity! Comes in a plastic tube that can be used to store your personal items while you're using your Tube Towel! If you do not choose a thread color, we will embroider in white. my yellow new cloth towel last night and just love how light it is even when wet!! !